Study the 4 areas covering industrial society. 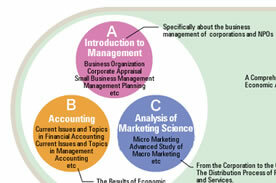 The Keio University Faculty of Business and Commerce defines "business and commerce" from a very broad perspective. You will be able to enroll in courses covering a wide range of areas of specialization regarding modern industrial society. Nurturing the ability to identify and solve issues based on "The Spirit of Jitsugaku". The Faculty of Business and Commerce offers courses that will help students identify and understand various issues in our society through investigation, actual experience and lectures by professionals. Make leaps and bounds in your personal development over the course of your 4 years in the Faculty of Business and Commerce. The curriculum at the Faculty of Business and Commerce has been designed to educate future leaders for our continuously evolving economic system. Our program is distinctive in that students are given the freedom to choose and design their own study program over a 4 year study period. Practicing Hangaku-hankyo at seminars, elevates your knowledge as a specialist to another level. Central to learning in Mita are the seminars*. This is where Keio University's tradition of Hangaku-hankyo is put to practice most intensively. *The "seminar" in this context refers to a group of select students that will engage in academic activities under one professor’s guidance for their third and fourth years. Refine your skills as a specialist through studying subjects in diverse genres from 9 fields in 4 areas. 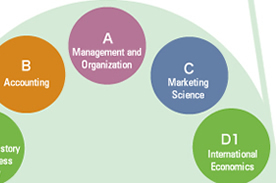 The four main pillars of professional education in the Faculty of Business and Commerce are comprised of Management & Organization, Accounting, Marketing Science and Economy & Industry. 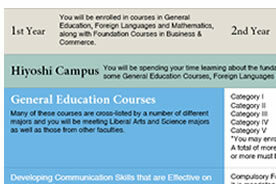 The Hiyoshi and Mita Campuses have an integrated specialized education program that supports this specifically. Keio University has been the top university in Japan for 41 consecutive years (as of 2015) for having the largest number of students who have successfully passed the Certified Public Accountant (CPA) examination. We are proud of the fact that 15-20% of those who have successfully passed this examination are either students or graduates of our university.